Unlike imitations made with purées and powders, our ginger shot is made simply with real pressed ginger, organic apple juice and water. Beautifully spicy ginger fused with organic apple, our original ginger shot makes a delicious wake up drink for early starts or mid-afternoon pick-me-ups. 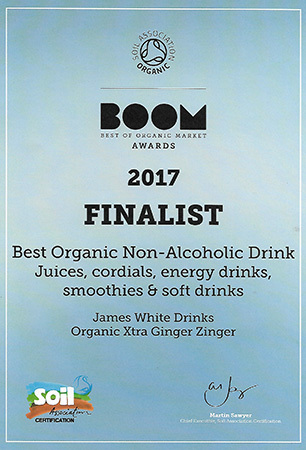 Fully certified as organic by the Soil Association, our ginger shot is the perfect drink for a healthy lifestyle. Ingredients: Organic apple juice 57%, organic ginger juice 26%, water, anti-oxidant: ascorbic acid. We pack a juddering 40% organic ginger juice into our XTRA Ginger Zinger. That's a a lot of ginger for a pocket-sized, 70ml bottle! Unlike our original ginger shot, the 'Xtra' Ginger is also made with organic chilli flavouring. Let's just say, you'll need to build up to this one! Think you can take the heat? Ingredients: Organic apple juice 59.5%, organic ginger juice 40%, organic chilli flavouring 0.5%, anti-oxidant: ascorbic acid.